Product code: ES318 Categories: Sold Items, Sold Rings. 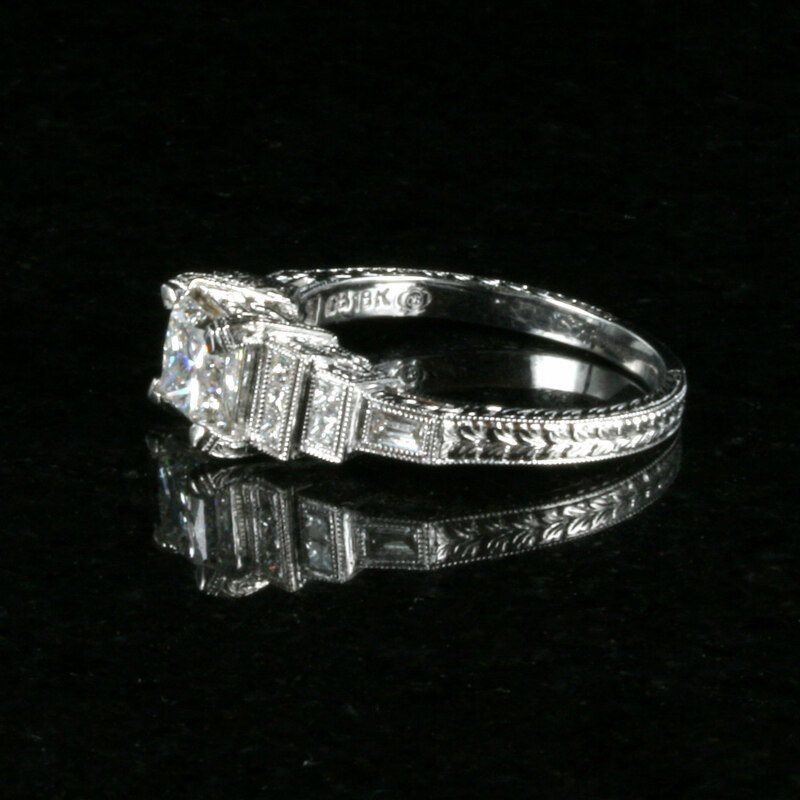 This is a stunning diamond engagement ring made in the Art Deco style and set with a magnificent Princess cut diamond and set with 5 square cut diamonds and one baguette cut diamond on each side. Made in 18ct white gold and with so much attention to detail, with the diamonds being beautifully set amongst wonderful hand engraving and the engraving continuing onto the side where there is also intricate and detailed scroll work that will have you admiring this engagement ring for hours. The centre Princess cut diamond measures 1.05 carats and is F colour and VS clarity meaning it is a very white and clean stone, and the other diamonds total 0.28 carats adding to the wonderful sparkle. These other diamonds are all milgrain set which is the fine and elegant crimping along the edge of the setting reminiscent of the rings of the Art Deco period of the 1920’s. A stunning diamond engagement ring such as this with so much attention to it, will have you admiring it and wearing it with pleasure.